Do you enjoy working with other people in a creative environment - getting messy and experimenting with different ways of expressing yourself? Art at the Farm could provide you with the ideal environment to develop your artistic and creative skills. 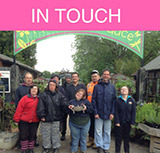 Art at the Farm is a thriving and dynamic enterprise situated on the Rare Breeds Centre site. The gallery has an inspiring workshop space where an endless array of arts and craft activities are possible. Design: desktop publishing using Photoshop, Illustrator and InDesign including commercial design work and commissions. Each artist creates their own portfolio and is encouraged to sell their creations to the public. The gallery supports artists with both complex & mild learning disabilities with the support of a skilled team of creative tutors. Art on the Farm also runs community art projects including exhibitions, shows and competitions. We also have a specialist sensory room. This area provides one to one and small group art and craft sensory sessions.